Hi all its been a while. Just wanna talk about the VC work that my school has taken part in this term. We purchased a camera late last year and didn't really have much chance to use it. Now this term we have managed to use it 3 times and hopefully more on the way. All off the VC where arranged though LGFL at no lost to us which was great. 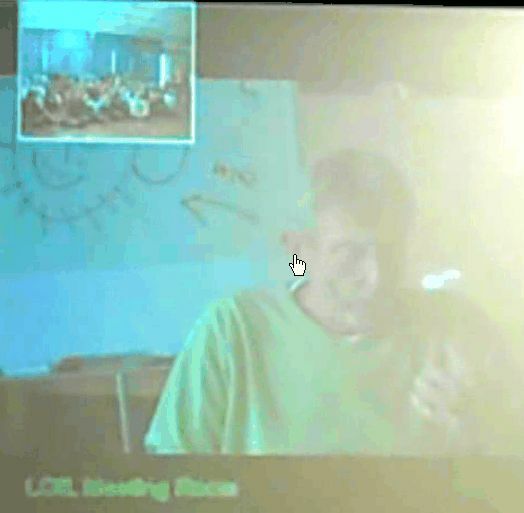 Firstly my year 4 year group met up with Michael Rosen via VC. We had a 20minute session where we read him some of our poems, asked him some questions and he performed some of his. It was a great experience and we had planned it as part of our work that week on performance poems. Click here if you would like to watch the session. Our 2nd and 3rd VC's where last week on the same day! Both year 1 and reception met up with Father Christmas. This is great. We connected to Santa's Grotto and he told us all about his holiday and then the children got a chance to answer questions. Our school news on this! Throughout these you are always thing how will the children react to the VC - will they understand that they are talking to a real person? In Year 4's case I showed them the camera and showed them all what they looked like on screen and gave them a chance to get all the waving out of the way. During the VC in the top corner we could see our camera image all the time, so the children where always reminded they could be seen. 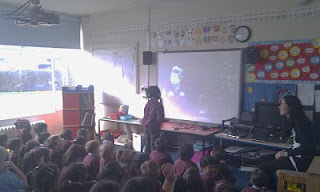 In year 1's case I was told to turn off our camera view as it would take up screen space for the video we where shown. The year 1's where told quickly about the camera but the weren't always reminded they where on screen. The year ones had to get up and talk into the microphone so it was almost like them coming up to speak to a person in class. Is it worth not having the home camera view on screen as it distracts from the full effect of the VC? Will have to try this again on the next one. Hopefully next year we will have more VC's with some American schools. Exciting.